Rania Matar situates her new series of photographs of female adolescents and womanhood in relationship to her own position as a Lebanese-Palestinian-American woman and mother. 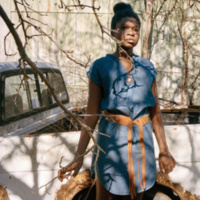 Her portraits, begun during a Mellon residency at the Gund Gallery, pose questions about what it means to be a girl and woman, whether in rural Ohio, the suburbs of Massachusetts, or the streets of Beirut, and exposes vulnerabilities, difference and individuality amid the beauty of transition. The exhibition will be on display March 19-April 19, 2018, with an opening reception from 5-8 p.m. on Monday, March 19. Rania will be in attendance at the reception and will give a gallery talk at 7 PM. Gund Gallery exhibitions and programs are sponsored, in part, by the Gund Gallery Board of Directors, the Ohio Arts Council and the Andrew W. Mellon Foundation. Image: Rania Matar (Lebanese American, b. 1964) "Destany, Fredericktown Ohio," 2017. Courtesy of the artist.